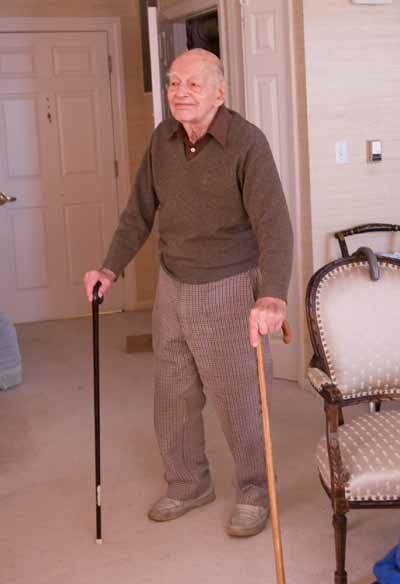 Henry Merrill at 101 in 2008, photo Tom Riddle. The article and picture of Marvin Kent and Henry Riddle I come from the archives of Mary Fitz-Gerald Riddle. The picture of Henry with a battery operated car was donated to this archive by Henry Merril in 2008, at which time Henry was a sprightly 101 years old. Henry is the son of Aimee Riddle, one of Henry Riddle I's daughters. The recent closing of the plant of the Riddle Manufacturing company summons into print a story of opportunity and what an American boy did with it; a story of how a lad of humble heritage became promoter, manufacturer, builder and co-worker, compelling success from seemingly impossible conditions by virtue of will and character deep rooted in the blood of sturdy ancestry. It is a story of honor, industry, courage and conquest. When fortune knocked at the door of this Pittsburgh boy, born in the city of Ft. Duquesne memories and educated in its early day schools, she did not have to repeat the summons, for he pushed wide the portals and entertained the Dame so well that she remained with him the rest of his life. This soldier in the ranks later became an adopted son of the Western Reserve, and it was Ravenna's good fortune to become his future home and the seat of his activities. Ravenna with him and Ravenna without him! About the difference between Kent with Marvin Kent and Kent without him. For the work and influence of this home builder stand out in clear outline against its background of progress and development. This was the biggest thing in his life, his way of extracting happiness from the environment about him, rejoicing in the battle, a commercial warrior by instinct, striking from the shoulder but fighting face-to-face and four square. "Ravenna is Queen of the Reserve," he declared, and he made the thought a living text, the inspiration of over fifty years of work for his municipal ideal. Home loyalty was his civic religion, and Moses Cleveland is not more lastingly enshrined in the Cleveland heart than "Uncle Henry" Riddle in the traditions and affection of Ravenna. More than any man or set of men, he helped put the town on the industrial and commercial map by his vitalizing ideals translated into realities. There was but one "Uncle Henry," business king and community builder, comrade and leader. Here are some of the things he did for Ravenna. 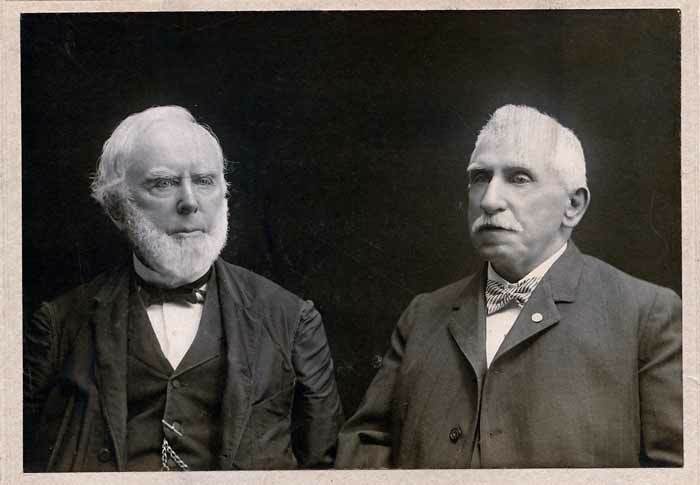 First, he developed the industry that amassed fortunes for himself and the late Charles Merts, his brother-in-law partner, who followed him from Pittsburgh to Ravenna in 1861, and which gave him financial equipment for his later enterprises. When these young men came here nearly 65 years ago, skilled mechanics, each began work at the bench as body makers for Clark Brothers, founders of the establishment in 1831. But the young man Riddle had other ambitions than those of the bench. His vision was that of proprietor and manufacturer, and he determined to acquire the business from his employers. But how was he to do it in the face of inadequate finances and meager commercial credit? He went to H. D. Clark, president and manager of the establishment and for many years president of the First National Bank of Ravenna, and told him what was on his mind. Clark, a keen observer, had been watching the young builder, in whom he saw qualities that invited trust and the helping hand. He gave them to him, making him an offer that would have frightened the average young man in a strange town with nothing but his head and willingness to work and sacrifice with which to make the venture. But he eagerly accepted the offer and forthwith blossomed out as proprietor, associating his brother-in-law with him as partner. The battle was on, and from that, time the trails of trade were kept hot by the indefatigable salesmen, who began to turn in business until the establishment became flooded with orders from year end to year end. "Did you ever hear of a young fellow coming into a new community, working at the bench one day and the next becoming proprietor of the establishment, with a purchase debt of $35,000? That was my situation at the beginning of the Civil war, and I want to tell you, it made me get up and hustle, night and day, until it was paid," said "Uncle Henry." And so it was that he accepted the challenge and won. But hardly had he got squared away to the world by clearing the partnership of its purchase debt before a fire swept the plant, destroying a total of 11 buildings, leaving only the three story Repository that had been added to the aggregation shortly before, and that is still standing. This was a staggering blow, but not a knockout for this champion of the commercial ring. Uncle Henry donned his fighting armor and got busier than ever making things come his way until they fairly tumbled over each other into his hands. He had a way all his own. "What was it? How did you do it?" was asked. "What WAS it!" he repeated. "What else could it be but to go out and tell people what I had to sell and make them want to buy it?" "But how did you make them want to buy against their will?" persisted his questioner. "I didn't," was the laconic rejoinder. "When I got through with them, they wanted to buy. That's all there was to it." The plant was rebuilt, vastly enlarged, and a second debt that hit the thousand mark many times was incurred. And again the reducing process went on under the magic of his salesmanship. Prosperity again smiled upon the establishment, until it began to be whispered abroad that "Uncle Henry" was a millionaire, the only one in Ravenna. Then came a second fire, this time in 1903, that again made ashes of all the buildings except the Repository. But hardly had the embers cooled before workmen were busy clearing the way for new and still larger buildings that were rushed to completion in record time, and operations resumed. In the meantime various buildings about town were secured in which to carry on the work of filling orders, so that the few days spent in finding them made the total time of suspended operations. Everything went as before, with an ever increasing prosperity until the advent of the automobile, with its challenge to the horse-drawn vehicle. 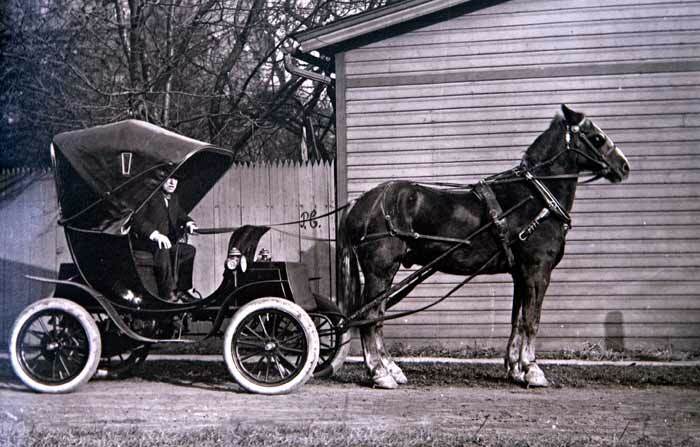 Here was the turning point, for "Uncle Henry" could not be persuaded to take the automobile seriously. "It is a fad of the hour and, like all fads, will be short-lived. Nothing will ever take the place of the horse," he declared. For several years he would not even ride in one of them, but later began to venture forth in short trips into the country, and to even concede a certain use for the "self runners" although never convinced. Henry somehow acquired a battery operated car which he attached a horse to incase the battery died. His daughter, Aimee, took this picture. But it was not enough for him to the horse. He therefore did not equip his plant for the inevitable change, and saw nothing in the suggestions of outside concerns that he change the establishment of which he became sole proprietor in 1890, into an automobile body plant. But even so, the manufacture of auto-coaches and funeral cars was introduced into the plant, which gradually discontinued the making of the old time horse coach and car, and the new establishment seemed destined to larger development. A new corporation, The Riddle Manufacturing Company, with proposed capital of a million dollars, was organized. A large block of stock was sold and plans made for an up-to-date plant along one of the railroads, the present plant being located in the uptown district, involving long hauls for incoming and outgoing shipments. But for some reason the project was arrested and, after a few years of diminished activity, the doors were closed and the industry is now in the hands of a receiver to wind up its affairs and give it legal burial for all time. Ravenna hardly seems Ravenna with the stilling of the shop bell that for nearly one hundred years rang the beginning and quitting hours of morning, noon and night. To older inhabitants it seems a tragedy. He was a born salesman and therefore an expert and successful one. It has often been said that his equal never went out of Ravenna, and certainly there was no superior. He worked while others slept. This was illustrated in his habit of, when making a town, to arise with the sun and go out in search of before-breakfast customers. But it was not enough for him to broadcast the name and fame of his adopted town. It must be made more worthy of the reputation thus given it. And so, as fortune began to reward him, he began to make home investments, buying up old home and business sites, removing their dilapidated buildings and replacing them with new and modern ones. One of the first of his larger enterprises, costing him upwards of $100,000, was the erection of Riddle Block No. 1, on the corner directly cast of the court house, in 1888. This is the former site of the old Exchange Hotel and a half dozen shacks, a sorry aggregation which a kind Providence removed by fire one night as the citizens slept. He then built in rapid succession the three story post office block and nine other structures, among which are the Elks building, the Western Reserve Hotel, blocks four and five on East Main and North Prospect streets, block 10 on East Spruce avenue, block seven, opposite the Elks building block nine, Main street facing the court house on the south, the Pythian block—all three story structures excepting block nine and the Pythian block, both of which are four story buildings. It was "Uncle Henry" Riddle's money, loaned on first mortgage, that built the White hospital, erected by the late Dr. W. W. White and now the Portage County hospital. He also erected a three story factory building of brick for the F. J. Loudin Shoe Company, giving it free rental for a period. He also added above 100 houses to the home equipment of the town. These, with the big industry he established, are principal contributions. He invested his money in his home town, lifting it out of its pioneer antiquities and making it more inviting each year of his life. "Uncle Henry" could not abide standard time. "God's time or none,” was his ultimatum, and he operated his big shops and made all of his appointments by "God's time," refusing to use or recognize any other. "Do you think God did not know what he was about when He made His own time?" he would ask. When the civil war came he went north to Ravenna where he spent the remainder of his life. He was married to Miss Emily H. Robinson, sister of the late Judge George F. Robinson, in 1866. She survives him, with their two sons and two daughters. He was a Churchman, Mason, Knight of Pythias, and a charter member of the Ravenna Lodge, B. P. O. E. Although a Democrat of life-long affiliation, his allegiance was to men and principles, rather than to any party candidate as such. Ravenna was the center of his interests and ambitions, and there was no form of salutation so much to his liking than that of "Uncle Henry." He was everybody's friend.